Did you know that barn owls mate for life? Are you aware that they are extremely emotional creatures and have many ways to express their feelings? Could you guess that they practice birth control and will breed only when they perceive an excess of available mice for food? These are some of the many intriguing facts about owls that readers learn in this little gem of a book. This book was recommended to me by my sister-in-law. I enjoyed its message so much that I am recommending this for my school’s next summer reading list. I found myself laughing aloud reading this book! Wesley the Owl by Stacey O’Brien is a book about love and devotion. It is a true love story about a woman and her owl. Stacey O’Brien is a Southern California biologist who adopts a baby barn owl with an injured wing. He could not survive in the wild so she selflessly takes him in, oblivious to the joy that stands before her in raising this creature. Through the trials and triumphs Stacey experiences with this bird, the reader realizes just what a significant role a pet plays in our lives. As Stacy states in her book, “When humans and animals understand, love, and trust each other, the animals flourish and we humans are enlightened and enriched by the relationship.” (O’Brien 202) Animals are more intelligent than we may give them credit for; this book reminds us of that intriguing reality. The story chronologically follows O’Brien’s 19 years with Wesley from owl infancy when she weaned him into his “nest box” in her bedroom through the end of his long life with his battle with cancer. She gives both her scientific, factual views and tender-hearted observations about Wesley. O’Brien even shares the insides of Caltech and some of her interestingly eccentric colleagues. I laughed when Stacey brought Wesley to the grocery store wrapped in a blanket as a baby, I gagged when she described how she killed endless amounts of mice for Wesley’s diets (yes, as much as I have much more respect for owls, I won’t be raising one any time soon), I melted when Wesley “held” Stacey with his wings, and I cried when Wesley tried to console Stacey through a horrible dehabilitating disease she contracted during Wesley’s later years. I could sit here and let my fingers ecstatically fly off the keyboard with all of my favorite tidbits from the book . . . but that would take out the fun of reading this book. You can definitely read this within a day or two; O’Brien writes her observations and feelings with fervor. As a bonus, she includes “Some Things You May Not Know About Barn Owls” at the conclusion of the book. We humans can learn from owls about devotion, trust and love. I am inspired by Stacey O’Brien’s life philosophies and the devotion she returns to Wesley. As she proclaims, she made a vow when she was very young to live life not by wading in the shallow water but by diving into the deep end as much as possible, no matter how dangerous. The way she raised Wesley attests to her commitment to that vow. As of the book’s print, she was contemplating raising another owl and beginning the whole process again! If I am ever lucky enough to have a chance encounter with one of these magnificent feathered friends, I will stop and admire this feathered friend and be very grateful for the opportunity. 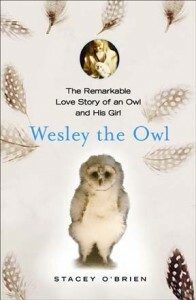 GG gives Wesley the Owl an A for the heartwarming lessons and touching account of this love story. Extra credit for the wonderful photographs spattered throughout the book – most of which O’Brien took herself while raising Wesley. They help illustrate just how funny, complex and beautiful Wesley was.